By Sandra Dickie The majority of mothers and fathers in our country work – be it part-time, full-time or more than full-time. So when it comes to educational choices for their children, working parents often overlook homeschooling. Parents believe they can send the kids to public, religious, or alternative schools, but the very real option of homeschooling their children may not seem feasible. Macomber Center, and other centers like it throughout the country, empower working parents to exercise their right to home educate their children. By providing a staffed, enriching environment for children ages 4-19, Monday through Friday from 9-5, the Macomber Center offers children of working parents a safe, reliable space where their kids can pursue their interests in the company of other homeschoolers. Self-directed learning is at the heart of the Center. Children come and do whatever it is that they need to do that day. For many of the members, this means chatting with other kids, engaging in board and card games, taking a hike with some friends, drawing or painting, or playing an instrument. For others, it is a chance to sit quietly and read or work on their computer. As homeschooling families know, learning does not take place only during ‘school’ hours of Monday through Friday. 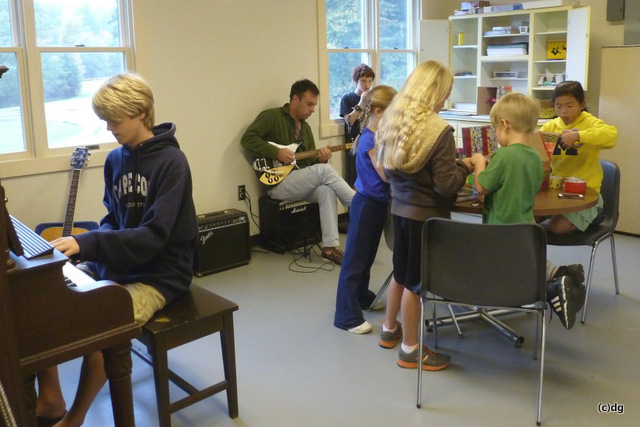 The Center does offer a variety of activities each week, which members can choose to participate in, or not. The staff at Macomber Center respect the endless variety of approaches to home education that take place outside of the time members are at the Center. Because the Center is not a school, members are not confined by an attendance policy – families are responsible for their child’s education, so if this means a child is pursuing an internship or attending a specialized class, they can still do that. Members choose which days they are attending each semester. Teens especially find that having a place of their own, where they can connect with other homeschoolers, is a valuable experience. Unlike coops, where parents are required to assist or attend the classes, the drop-off nature of Macomber Center gives kids this very important freedom from home, without confining them to the requirements of school. Macomber Center offers families the freedom to do what they deem important; families do not need permission to ‘pull’ children out of school when relatives are visiting from out-of-town, or to go visit a museum, or simply have a mental health day in pajamas at home. Until recently, homeschooling and working parents did not seem compatible. With the opening of Macomber Center in 2012, and the growth of other resource centers throughout the country, working parents have been empowered to take advantage of this schooling option for their children. In an age of increasing standardized testing and decreasing respect for the needs of the individual child, homeschooling has become a popular, mainstream option for many families. Macomber Center helps guarantee that it is an option for all parents, not just those who are home.